The National Space Society takes great pleasure in announcing that its 2014 Robert A. Heinlein Memorial Award has been won by acclaimed space entrepreneur Elon Musk, the Chief Designer and CEO of SpaceX. 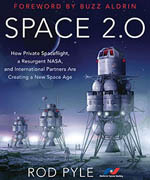 In the last decade, SpaceX, under the leadership of Elon Musk, has been moving directly toward accomplishing goals that many of us in NSS think are of utmost importance, such as forcing a drastic reduction in launch costs by doing the very hard task which no one else in the world has been willing and able to tackle: working to create a family of commercially successful and reusable rocket boosters and reusable spacecraft. The National Space Society’s prestigious Robert A. Heinlein Memorial Award will be presented to Elon Musk at the 2014 International Space Development Conference (ISDC). The conference will be held at the Sheraton Gateway Hotel in Los Angeles, CA. The ISDC will run from May 14-18, 2014. The imaginations of our visionaries of the last 100 years will not be fulfilled until affordable, large scale and high mass operations can take place in Earth orbit and beyond. SpaceX’s Dragon spacecraft is reusable and SpaceX is making great progress towards a reusable rocket, the key development that would make such operations possible. Elon Musk was born in South Africa in 1971 and emigrated first to Canada and then to the US. He has two B.A. degrees, one in physics and one in economics, from the University of Pennsylvania. He became a multimillionaire in his late twenties when he sold his start-up company, Zip2, to a division of Compaq Computers. He went on to more early successes, launching PayPal via a 2000 merger. He founded Space Exploration Technologies Corporation (SpaceX) in 2002, the same year that he became an American citizen and also the same year he earned the money to fund the new company from the sale of PayPal. The SpaceX Falcon 1 was the first privately funded liquid fueled rocket to put a payload into orbit. The larger Falcon 9 rocket has been flying since June 2010 and SpaceX is also developing a reusable version called Falcon 9R and a much larger rocket, Falcon Heavy. 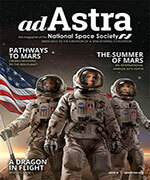 SpaceX has a 1.6-billion dollar contract with NASA to supply the space station via its recoverable Dragon spacecraft. They are also a competitor in NASA’s Commercial Crew Program. Like NSS, Musk views space exploration as important for the preservation and expansion of humankind. Musk likes to say that we should become “multi-planetary” as a hedge against all threats to our survival. He said, “Sooner or later, we must expand life beyond this green and blue ball—or go extinct.” To help make that happen, Musk’s goal is to reduce the cost of human spaceflight by a factor of 100. The Heinlein award is presented once every two years for lifetime achievement in promoting the goal of a free, spacefaring civilization. The winner is determined by a vote of the NSS membership. The award consists of a miniature signal cannon, on a mahogany base with a black granite inlay and a brass plaque as shown. The award concept came from Robert Heinlein’s classic book The Moon is a Harsh Mistress. Previous winners include Sir Arthur C. Clarke and Dr. Carl Sagan. 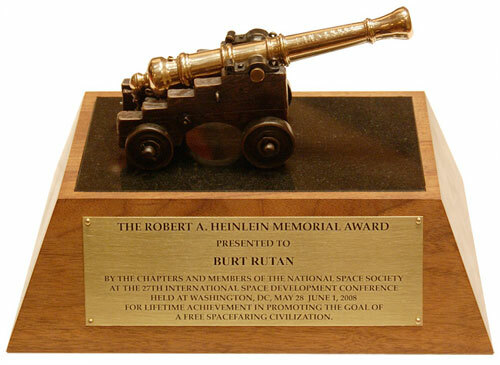 More information about this award is at: https://space.nss.org/national-space-society-heinlein-award/. The International Space Development Conference (ISDC) is the annual conference of the National Space Society, bringing together NSS leaders and members with leading managers, engineers, scientists, educators, and businessmen from civilian, military, commercial, entrepreneurial, and grassroots advocacy space sectors.